Real Pickles does what its name implies: the worker cooperative makes pickled foods, such as cucumbers, cabbage, carrots, and beets, using natural fermentation. The process depends on naturally occurring lactic acid bacteria which ferments the vegetables, the purpose of which is to preserve them for long after harvest season. “When we first started [in 2001], there weren’t many companies making this kind of food,” says Addie Rose Holland, cofounder with now-husband Dan Rosenberg. Raw fermented vegetables offer bacteria beneficial to the digestive system. When vegetables are pasteurized and heat-packed to be shelf-stable (and often preserved in vinegar), you lose the probiotic properties or healthy bacteria, she says. All of the company’s products are organic, made with ingredients that come from within a 40-mile radius, a truly local effort. “We’re very committed to that part of our mission,” says Holland. The only beverage Real Pickles produces is Beet Kvass, a traditional Ukrainian tonic made the same way as other fermented foods. The kvass, which contains beets, onion, cabbage, herbs, and salt, is a stunning dark purplish-red, but an acquired taste: the drink, heralded for its probiotic qualities, has a salty, pickle-y, slightly tart, earthy flavor, light-years from the sweetened beverages most Americans are used to. “We drink it as a beverage, use it as an ingredient in borscht, and add it to salad dressings as an acidic component,” says Holland. 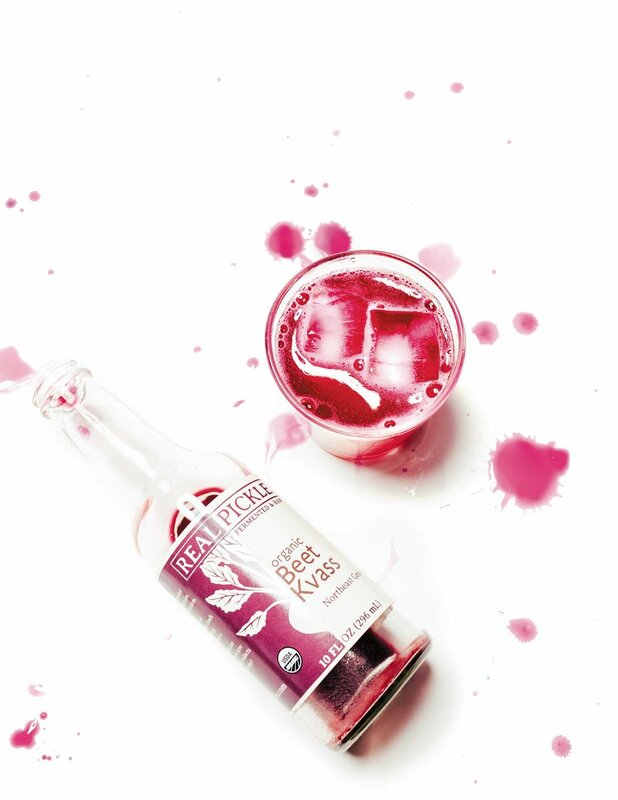 At her and Rosenberg’s 2012 wedding, the couple demonstrated their commitment to the company’s mission, as well as each other, by serving all their pickled products and a sparkling pink beverage made from Champagne, beet kvass, and agave nectar.